As someone who is commonly misunderstood by first impressions, I feel that it is incumbent upon me to not allow myself to be too swayed by them. 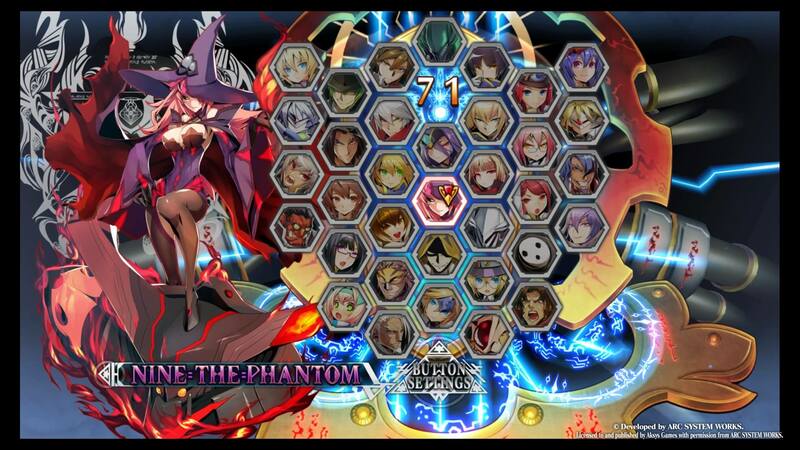 Still, the first impression BlazBlue Central Fiction gave me was not a very positive one. At first blush this looked to be a misstep, or even a step backwards, for Arc System Works. The reason for this impression came down to two factors. The first was that BlazBlue has had many iterations so far and using the same fighting and graphics engine has definitely started to show its age. The second factor was that Arc System Works currently has another major franchise that produced a gloriously beautiful new game a few months ago, Guilty Gear Xrd -Revelator-. As much as I’m a vocal defender of the both the fighting system and the release model of Street Fighter V, I thought for sure that Guilty Gear Xrd -Revelator- was going to be my fighting game of the year, as you can tell from my review. If I’ve gone this far hinting, you can tell that I bring this up because my bad first impression of BlazBlue Central Fiction got changed really quickly, and I may have to change my fighting game of the year. That is a boat load of characters to choose from. While it was necessary to keep the graphics engine the same or similar due to the game’s continued existence on the PlayStation 3, the game still doesn’t look bad. One advantage that they gained from keeping it the same is that they didn’t have to rework all the characters (other than small changes to their movesets and some new skills). As a result there is a mammoth list of characters for you to choose from in this game. They returned to the fold every single character you could choose in all previous BlazBlue games, they added 4 new playable characters immediately available, 1 boss character you can unlock after you finish Story Mode, and 2 new DLC characters (they are seen in the Story Mode but must be purchased in order to use yourself). That brings the grand total of characters to 41. Given the diversity of the cast and the wide variety of mechanics they can use, it will take you a long time to get proficient with all of the characters. The great part of that is the depth and replay value. The disadvantage is that you will really need to do a lot of acclimation before you expect to succeed much in online versus. If someone comes at you with a character you are totally unprepared for, expect to get waxed. 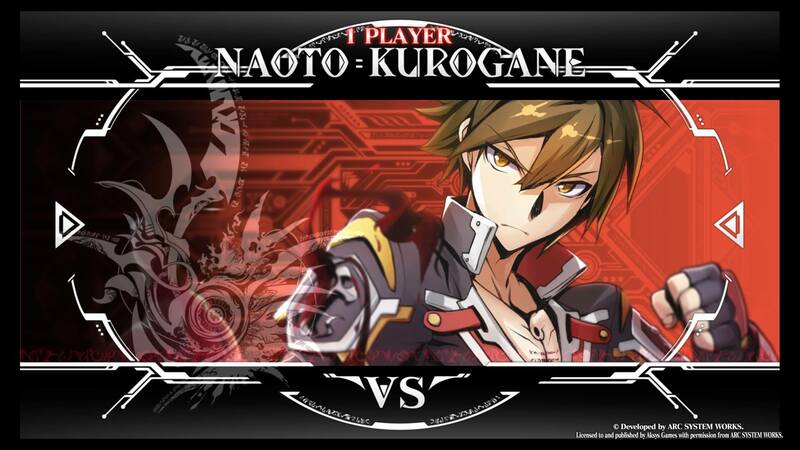 Naoto has a very similar look to Ragna. This is not a mistake or a lack of new ideas. Naoto Kurogane is the first new character added to the game. He’s new to the BlazBlue fighting games, but he is not new to the overall world story. 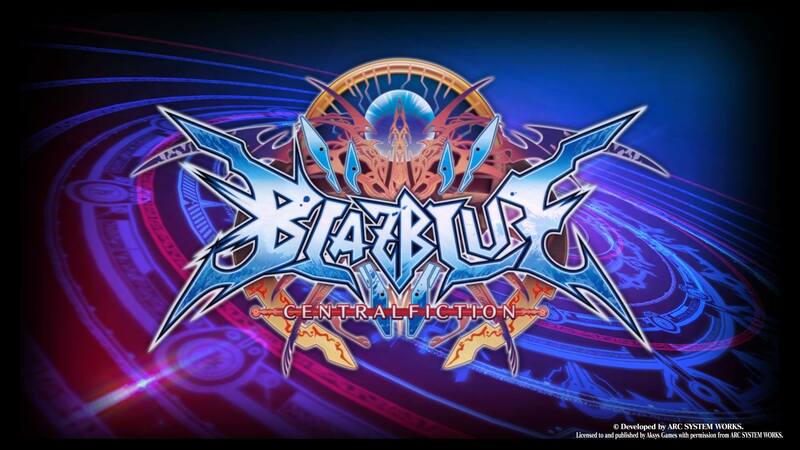 In a fascinating move for Arc System Works, they are bringing together all the disparate elements of the overall BlazBlue franchise into one game. Naoto is from the series of BlazBlue light novels called Bloodedge Experience, and his similarity to Ragna the Bloodedge is not by coincidence. In many ways he is an alternate dimension version of the BlazBlue protagonist. As far as what he is doing here, I will not spoil that surprise. I don’t think that he means to be a trap, but I thought he was a girl at first. 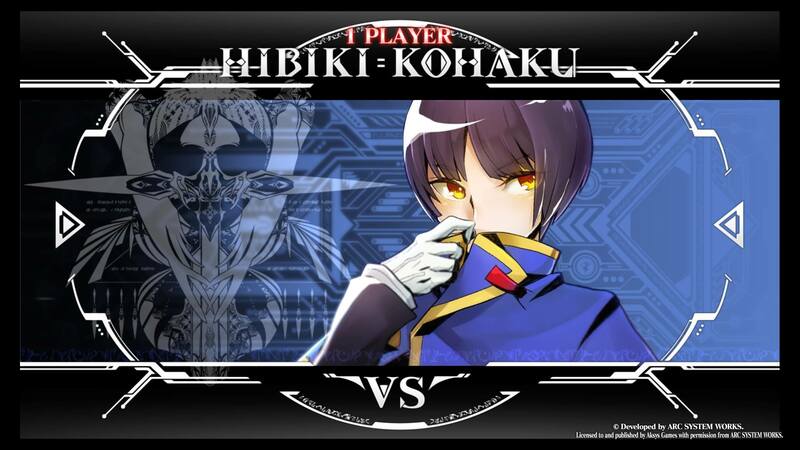 The next new character is Hibiki Kohaku, and he’s the assistant to Kagura. We’ve seen him before in the series, but this is the first time we’ve seen him actually fight or been able to use him. Strangely enough, once you use him the immediate vibe you are probably going to get is Attack on Titan. He uses double segmented blades, exactly like in that series, and the way he attacks and moves around gave me strong vibes from the anime. That being said, any of those humans would have loved to have the ability to throw around their shadow and teleport to where it ends up. Spend a lot less time giving a Titan indigestion that way. Nine, you can enchant me any time, just by looking in my general direction. Nine the Phantom is possibly the most interesting new addition to the cast. 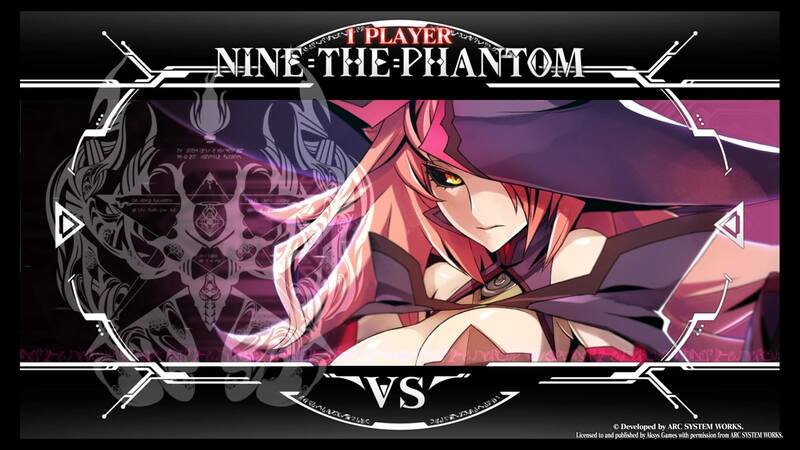 She has been seen lurking around in the last couple BlazBlue fighting games, but she has been mentioned in hindsight throughout the entire series as one of the 10 Heroes. She also happens to be a furry fan, as the wife of Jubei and mother of Kokonoe. But the most interesting thing she brings to the cast is her fighting style. She kind of combines some elements of Platinum the Trinity with Dormammu from Marvel vs. Capcom 3. She can attack with three elements; fire, water, and air. (She can also attack with dark element at specific times) By attacking with those three elements she will build up stocks of those spell types. By combining those stocks she can cast many different spells, most of them extremely devastating, some of them very tricky to dodge. She is very difficult to master, but extremely fun to watch, and potentially extremely powerful in the right hands. Hard to believe that much evil is housed in that cute of a package. Izanami is the Imperitor of the NOL and has been heard from or briefly seen since about halfway through the series. She was always behind the scenes pulling the strings, but you never really knew quite who was behind everything until several games in. Finally you can face off against her, and you can also choose her as a character. She makes a very strange addition to the cast, however. She’s potentially very weak or very strong, depending on how she is used. While that is true of pretty much any fighting game character, it’s even more pronounced in her. Her form makes her look like the rest of the dolls in the cast, such as Lambda and Nu, but she could not be more different. 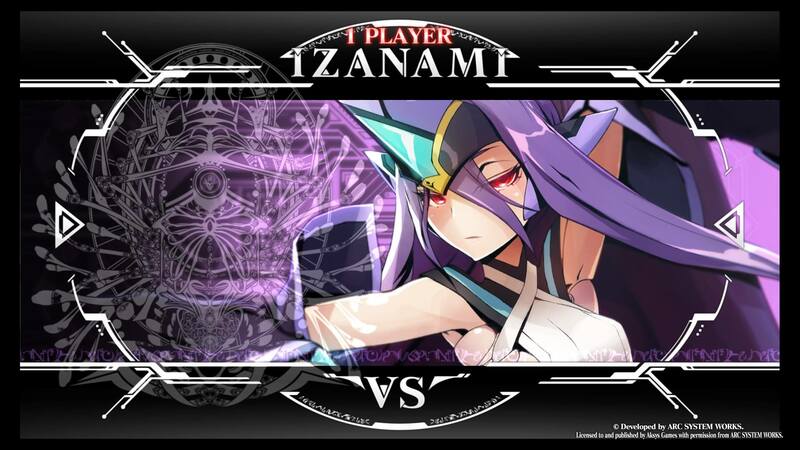 Izanami can he can use some projectiles, and her float makes her very mobile. But you are looking at a tiny grappler character. That’s right, folks, this tiny girl is an extremely mobile Iron Tager. He looks like pure evil, and that is not a mistaken impression. 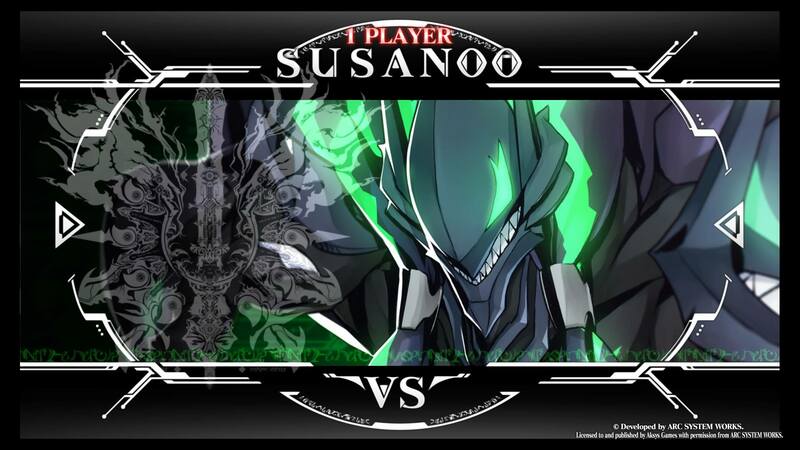 Susanoo is an addition to the cast that only becomes available to use after you unlock him by completing the main route of Story Mode. As such, there are many things about him that I will not spoil. You can buy the unlock as DLC for a couple dollars, but there is really no need to do so since he’s unlockable just by playing the game. His name is very instructive as to his origins and his modus operandi, if you know very much mythology. In fact, the more mythology (and especially Shinto) you know, the more you are going to get out of this story overall. This is not the only character who has a strong mythological base. Amaterasu and Izanagi and many other gods play a large role as characters or concepts. As far as his playstyle, it is most similar to Hakumen for a very good reason, but he’s like a much more powerful version of that character. I do not think he’s so overpowered that he would need to be tournament banned, but he can be quite the beast. Mai is premium waifu material, and her presence in the story is welcome. 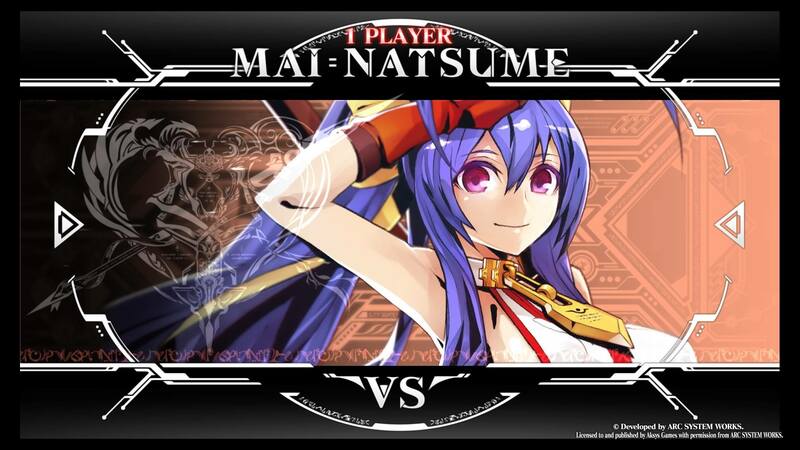 The first DLC character is Mai Natsume, so she immediately comes with a significant barrier of entry. $7.00 per character is a rather steep price for DLC, but given all the new systems each character has exclusive to themselves and all the balancing that needs to be done, they are certainly worth more than just something like new character colors. It does make me wish the business model would not compel the companies to charge so much for extra characters instead of just charging $10 more for the game itself, though. That being said, the character herself is a good one. She comes to the game from BlazBlue manga series, first appearing in Remix Heart and then its sequel Variable Heart. That manga takes place within the main BlazBlue universe, so she actually knows the NOL and Sector 7 characters pretty well, even if she has been far from the actions of all the fighting games in the series. Es might have taken over for Rachel as my official BlazBlue waifu. The second DLC character might be my favorite new cast member, Es. I do not have much attachment to the characters from the light novels or manga, because I haven’t read either of those sources personally. 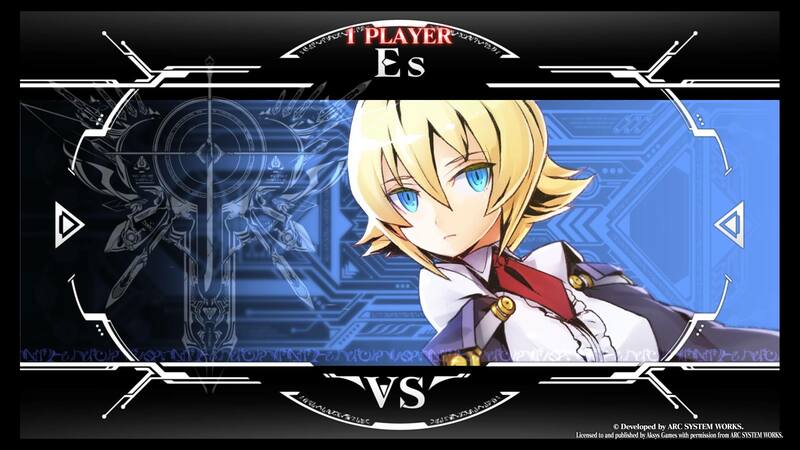 However, Es is from the XBlaze series of visual novels, which is an alternate universe version of the BlazBlue story. And I have actually played/read the XBlaze series, and rather enjoyed them. Es was already my favorite character from that series, so seeing her here was already a joy in and of itself. But even better than her mere presence, she is a really great character. I actually expected her to play more like a doll character when I first saw her in the Story Mode. But it turns out that she keeps her feet on the ground and she makes use of a large sword. It’s not as large as the sword from Kagura, but it has a few interesting additional properties that makes her singular. So she’s really cute and she’s quite a proficient fighter. All you could want from a fighting game waifu. 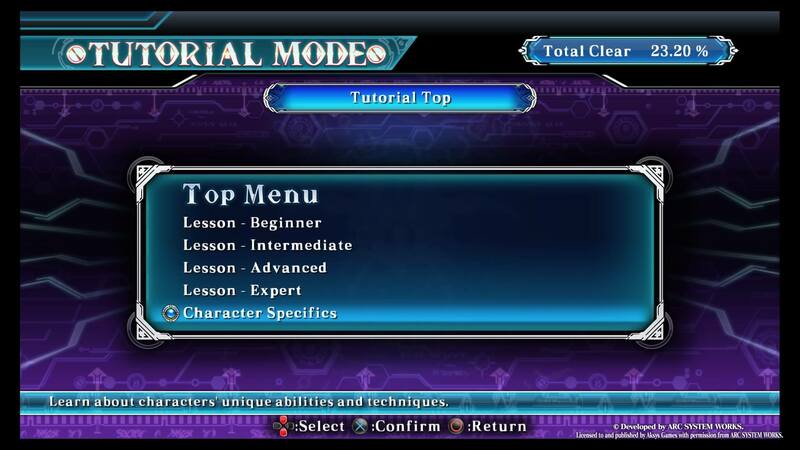 The Tutorial Mode is good, but Guilty Gear Xrd -Revelator- has the best ever.